You may have already guessed it by the shape, size, and color, but just to be clear, the parsnip is indeed a close relative of the carrot. Until the potato arrived to the New World, the parsnip (along with other root vegetables, like the turnip) were used in soups, stews, and stocks to develop flavor and act as a thickening agent. While parsnips originated in the Mediterranean and were the size of a baby carrot, explorers and settlers found that they grew larger and more successfully the farther north they travelled. 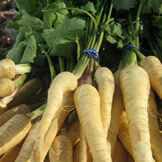 Parsnips seeds are typically planted during the fall and winter months, and it is the frost that occurs during these seasons that helps the plant develop its flavor.